Monday 29th August - Lighting and spares! Bank Holiday saw a visit from me old mucker Dave who was wiring the spot lights up for me on Gertie. A 'drive through' will be the the order of the day on the first day of the 10CR, (This means we drive through the night) So some additional lighting was the order of the day. Dave plodded on with the lights while I made some final adjustments to seats I had fitted over the previous two days. Once the spotlights were fitted, we then had the same problem as before with the ignition light coming on. It's highly unlikely that I've been sent another duff alternator so maybe I have an electrical issue elsewhere! Grrrr.....! Not what I wanted so close to the 10CR! Sunday 28th August - Passenger seat now fitted too! Not much of a busy day today. All I did was fit the passenger seat. It was a lot easier to fit than the drivers side, but that's because there was no height adjuster to contend with. I'm really pleased with them though. The colour match is spot on and you wouldn't think that the seats weren't original if you wasn't a Triumph buff! Saturday 27th August- A bit of comfort! Today was spent, grinding, drilling, filing, swearing, and doing all the other things necessary to make some 2002 Alfa Romeo156 seats fit into a 1969 Mk1 Triumph! Needless to say, it wasn't easy. I have managed to get the drivers seat in so far, but the runners don't 'run' as easy as they should and I will have to relocate the seat belt reel as it gets in the way of the recliner. I have to say though, they're a good colour match and they look the part, but it's time consuming to say the least! Just as well that I have the long weekend off then! Friday 26th August- Time to cool down! With the thought of Gertie having do some 'mountaineering' in the form of tackling 21 Alpine passes on the impending 10CR run, I decided that it might be a good idea to change the thermostat. I have never had the car overheat, but the temperature gauge has always read just above half way. So, Friday night after work I bit the bullet and carefully removed the thermostat housing bolts. Luckily, neither of them sheared off (as they normally do) and the thermostat was soon removed. As you can see from the pic below, it wasn't a pretty sight! However, it was still working, so it was shoved in the box that the new one came in and will be taken along as a back up. I also noticed when I started doing the job that the water level was was quite low, so a quick inspection once the car was running again revealed a few leaking hose clips that were promptly tightened and put right. The next task will be a good test drive and make sure all is well. Once the engine is warm from the test drive I will also adjust the valve clearances one more time before the trip across the water. Sunday 21st August. Grass Autosolo Day! Well, the day finally came that 'old yellow' was fit enough to compete in an event. 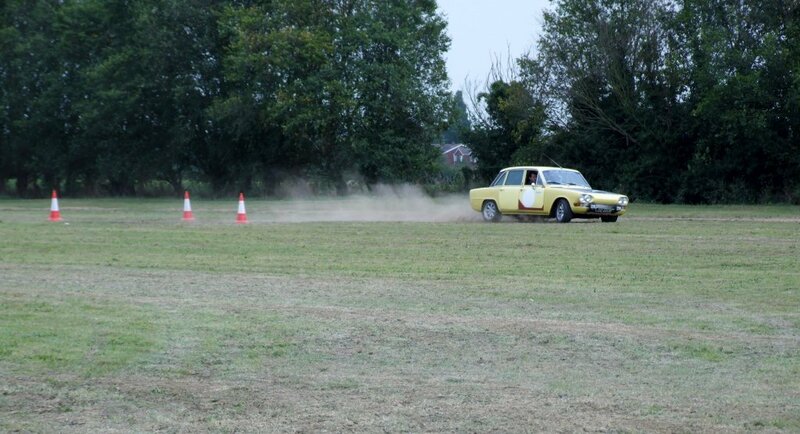 The competition in question was a grass autosolo organised by Wickford autoclub. It was being run on Club Triumph Member Mike Helm's field, so he managed to persuade them to let a few of us CT members to take part. 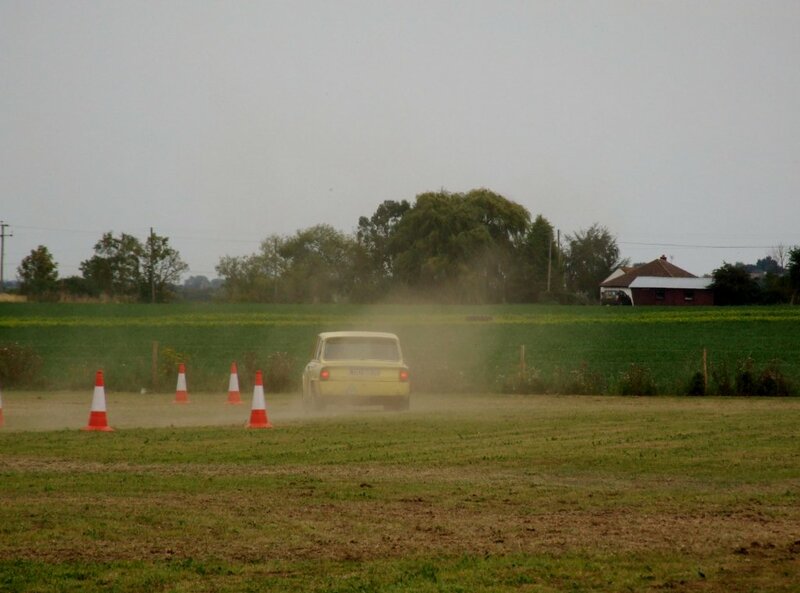 'Old yellow' performed well, but to be honest I probably didn't push her as hard as I could have done. What with it being its first proper hard pushed event, I didn't have the confidence to give it a real serious caning! So as a result of this, I didn't feature much in the results. Never mind, I had a great day anyway and I'm looking forward to using the car on more events now. Saturday 20th August- Autosolo Preparations! For a long time now I've been meaning to buy a proper battery box for 'Yellow'. With all the extra gubbings under the bonnet there's no room for the battery, so it had been relegated to the boot area. I'm using the car for an Autosolo on grass on the 21st and an insecure battery would result in a fail in scrutineering and refusal to enter. The original system of a baking tray and bungee strap was obviously not good enough, so a new battery box was fitted and the battery is now secure. While the car was out I also replaced a leaking radiator hose and then took the car for a run. I was disappointed to find that despite recently changing the propshaft and a driveshaft, I have still have a vibration at over 70mph. I'll have to look at the other drive shaft to see if that's giving me the problem. On a good point though, I did find that the clunking noise from underneath was gone. This must have been down to changing the gearbox mount last weekend. The rain decided to pay a visit so with a quick final check over of the car, I decided to call it a day. I wont be doing over 70mph at the Autosolo anyway, so I'm not too worried about the vibration. The rain should also water the field nicely and make the conditions 'interesting' too. Watch this space for a full report! Tuesday 16th August. New seats for Gertie! With the 10CR looming and Gertie still having her original (and somewhat uncomfortable) seats, the thought of travelling nearly 3000 miles in them wasn't appealing. With this in mind some more suitable seats were purchased (Good old ebay!) and collected from Canterbury in Kent. The seats are from a '52 plate' 156 Alfa Romeo. Gertie has a red leather interior, so I wanted some that wouldn't look out of place. These should do the job fine! All I need now is the bloody car back from the workshop so I can fit them! Monday 15th August. 10CR Drivers meeting! We also finally got to find out where we will be going. The countries are: France, Belgium, Luxembourg, Switzerland, Italy, Liechtenstein, Austria, Germany and Holland! We will also be climbing 21 Alpine passes over the Alps, so it will be no doubt be a trip to remember. Gertie is currently in Carlow engineering having her gearbox repaired, and the new alternator has also decided to give up the ghost, so a replacement one has been provided free of charge and will be fitted when she returns. Sunday 7th August- Miserable Git Dave! With the impending 10CR looming, my normally happy mate Dave was requested to get some music fitted into Gertie. This is normally a straight forward affair and shouldn't take any longer than a couple of hours at most. Friday 5th August - Starter motor issues resolved. After the yellow car embarrassing me in front of my neighbour Liz the other week, I decided to get it looked at. I first dropped in a place opposite where I work, but soon took it back again when they told me the solenoid was knackered. They wanted £136 plus vat to fix it! How much? I can buy a complete brand new one for £190 plus vat. The thing is, the car was still starting 8 times out of 10, so I didn't believe it had a knackered solenoid. If it did, it wouldn't start any of the time. So I found another place in Grays that had a look at it and decided it was a case of dirty contacts. (I'm sure I bought a magazine called that once?) :-) They quoted me a more acceptable price of £70 plus vat, so the deal was agreed. Come Friday night I had a nicely restored starter motor to refit. While I had the car up in the air, and remembering being shaken to death over 60mph last Saturday, I decided to remove the propshaft and check out both UJ's. They seemed ok, but I also had a prop laying around that I knew the balance and UJ's on were good, so I fitted that one instead. I also changed the o/s/r driveshaft as the wheel bearing in this was completely shot! Hopefully, that's the cause of the vibration. (A test drive will follow when time allows!) I finished off by topping up the diff oil as well.